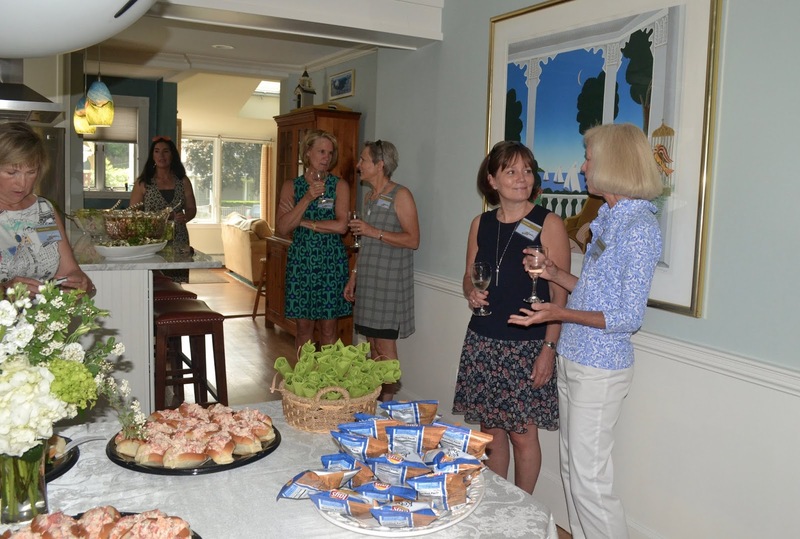 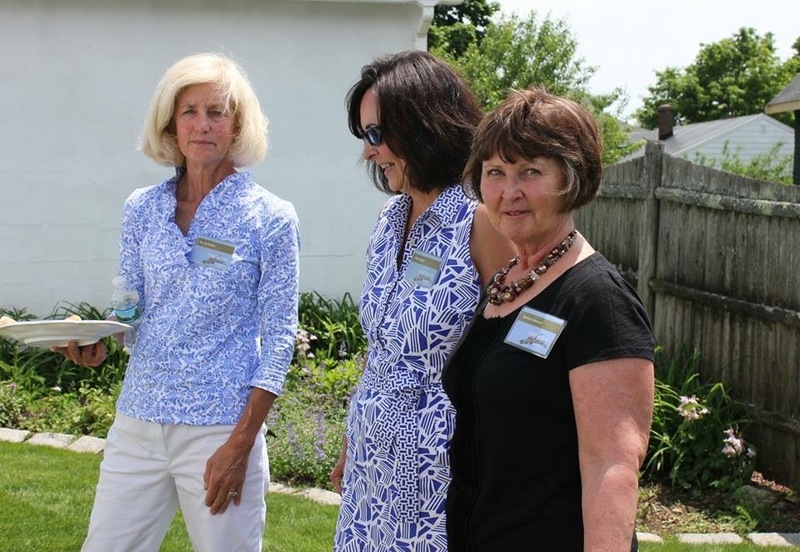 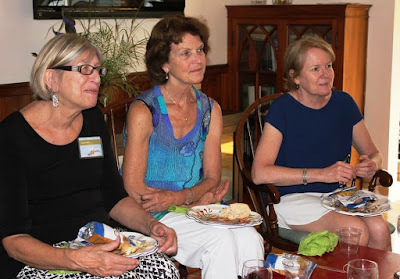 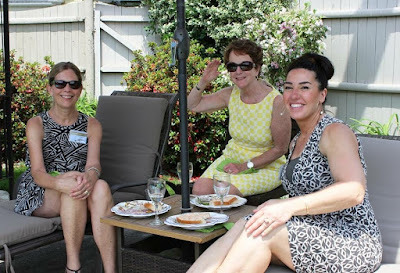 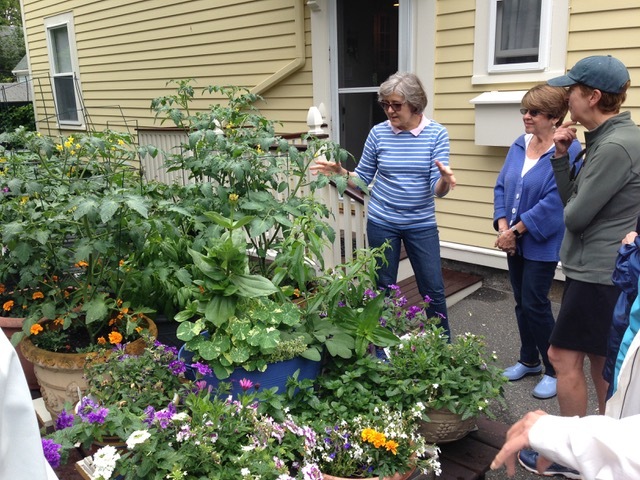 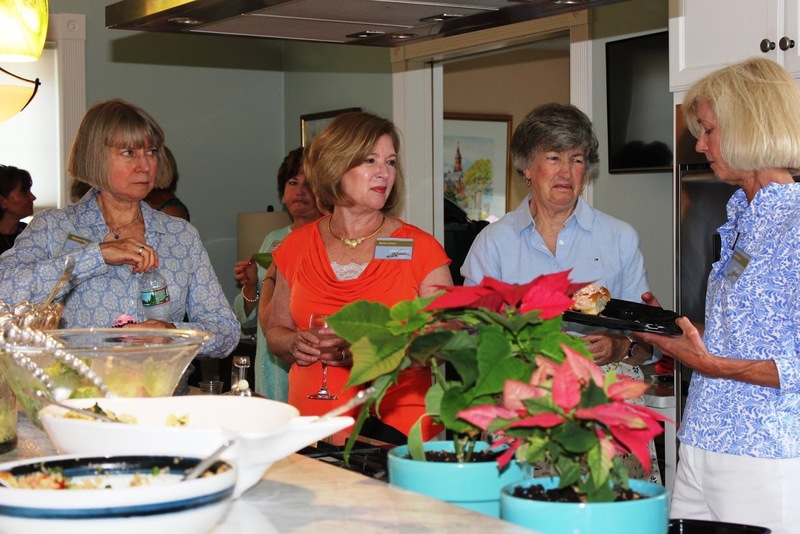 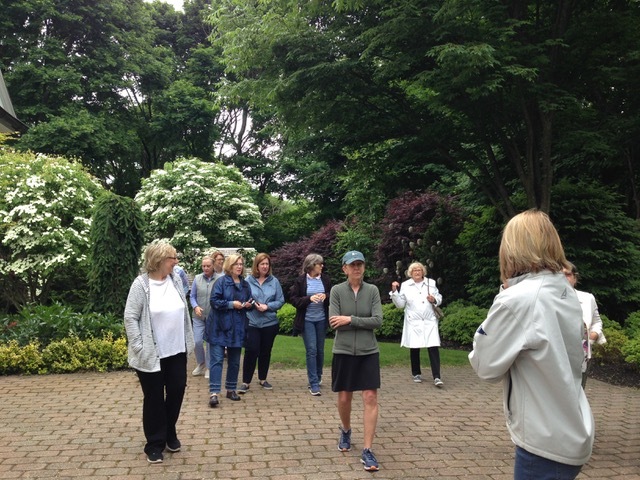 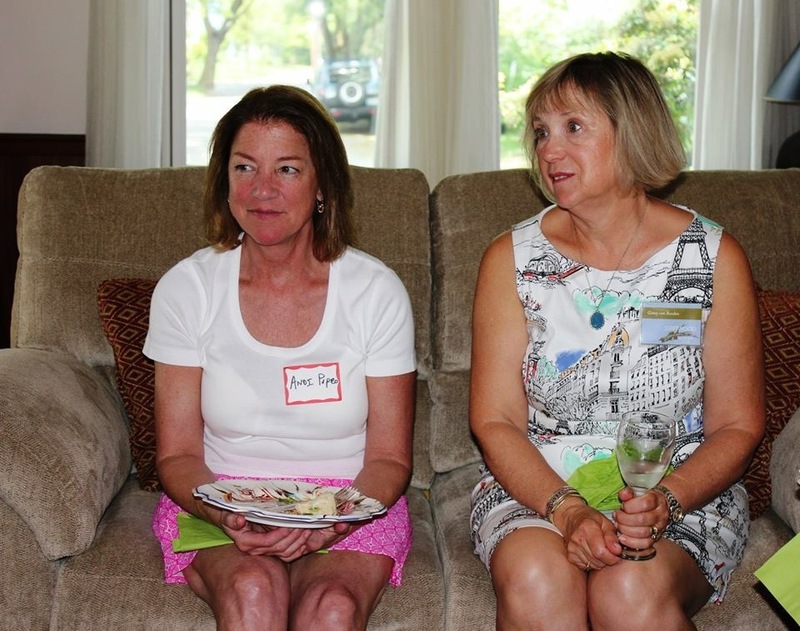 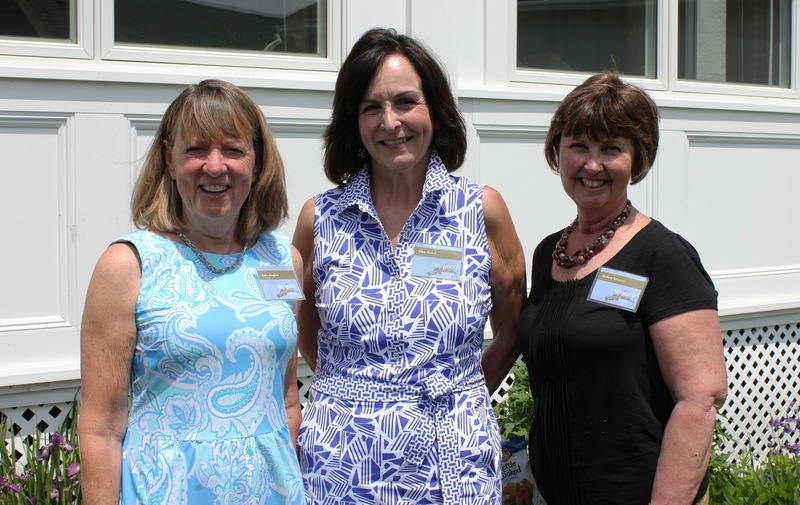 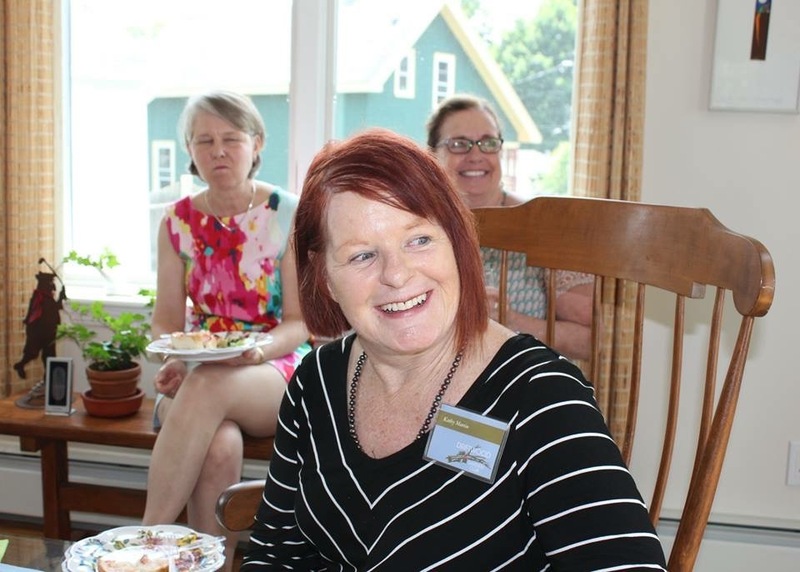 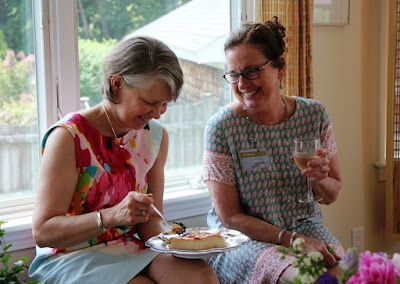 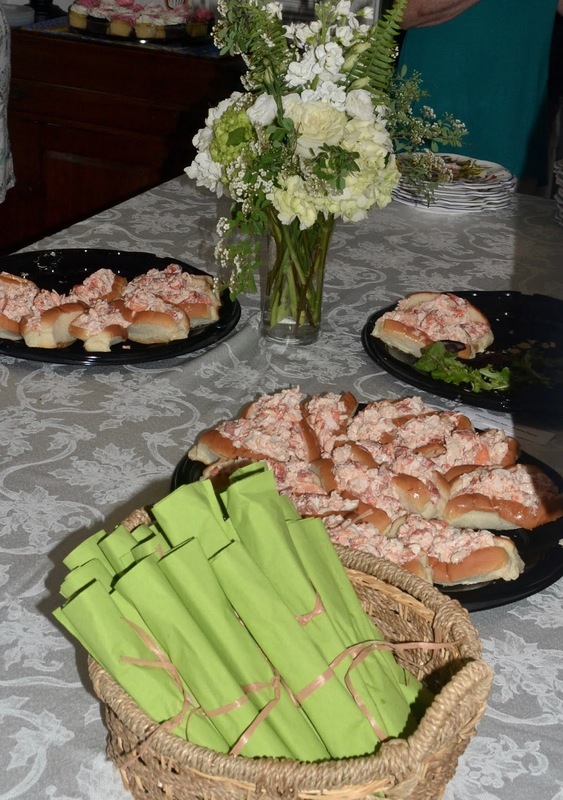 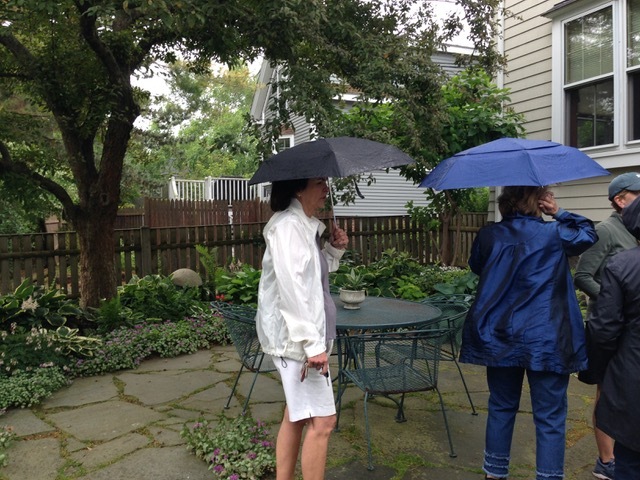 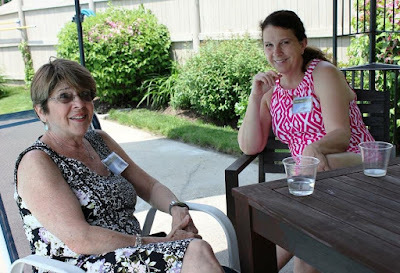 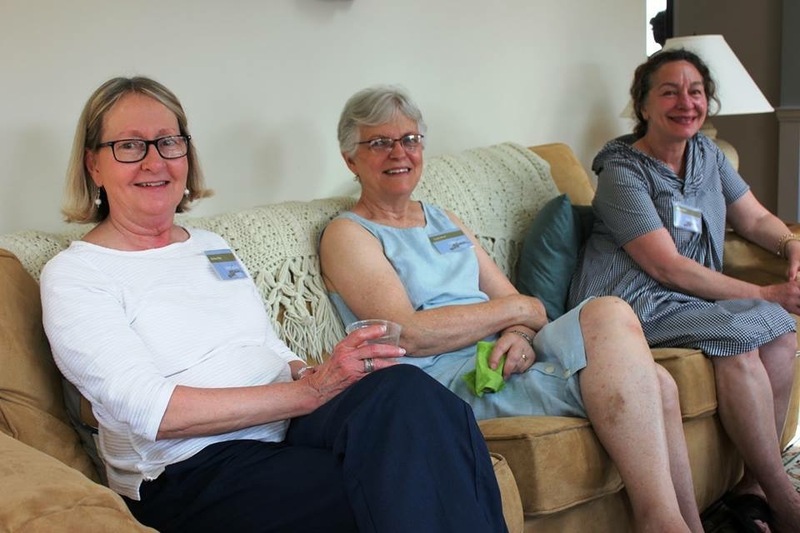 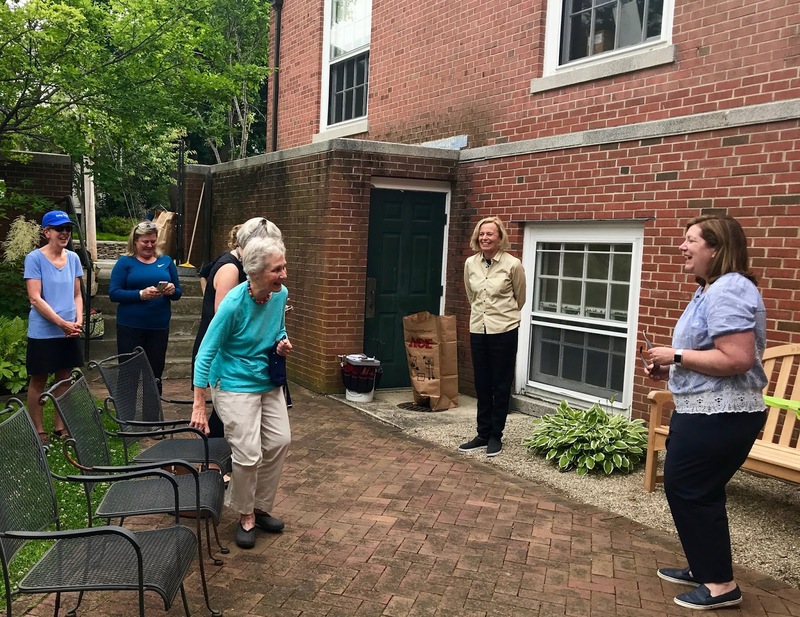 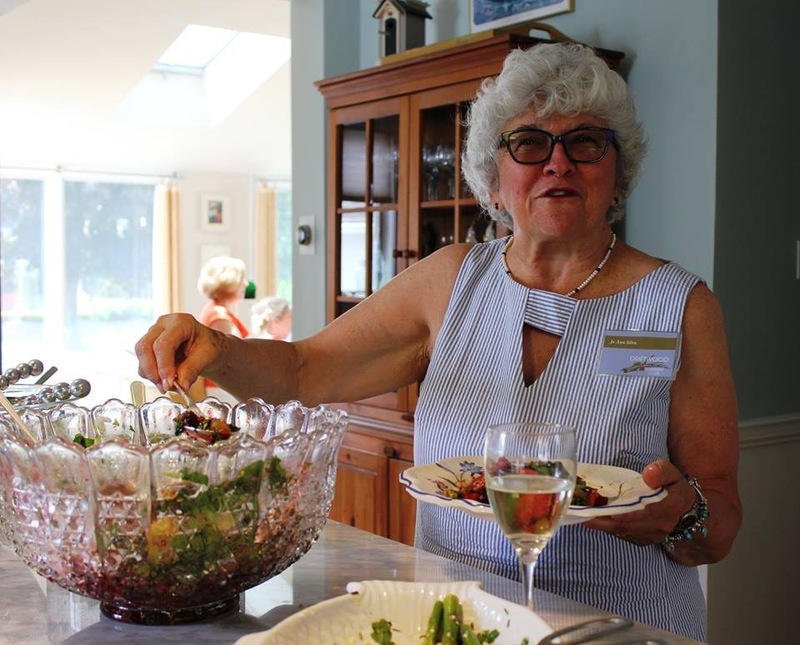 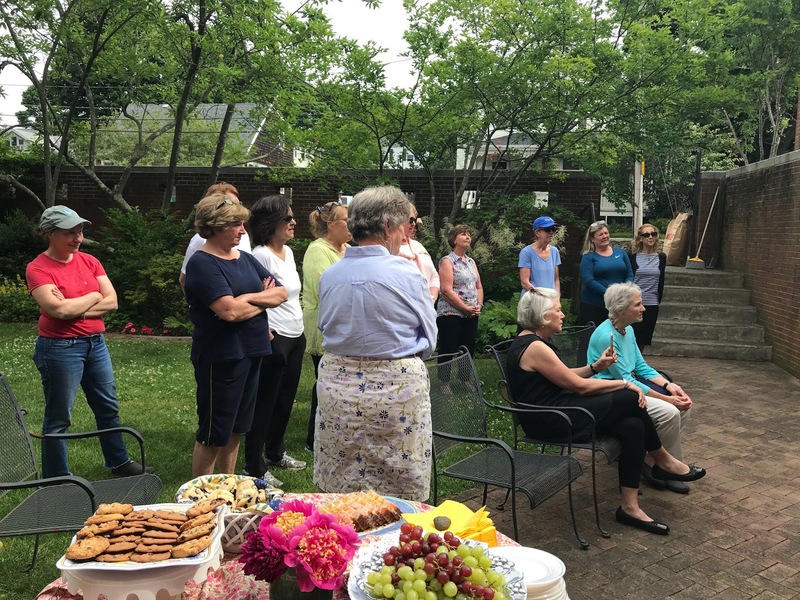 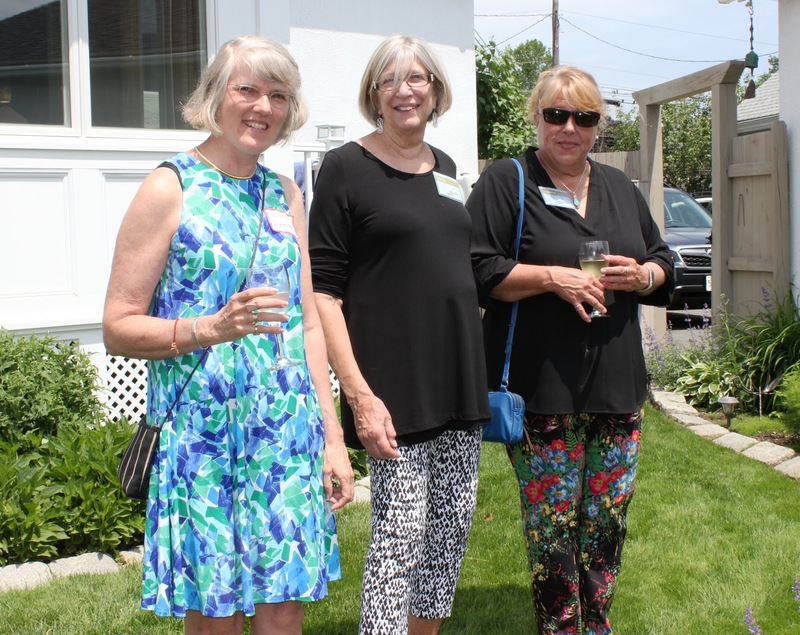 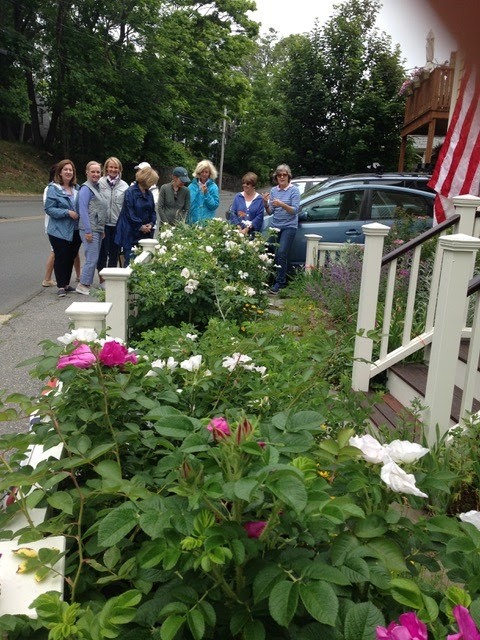 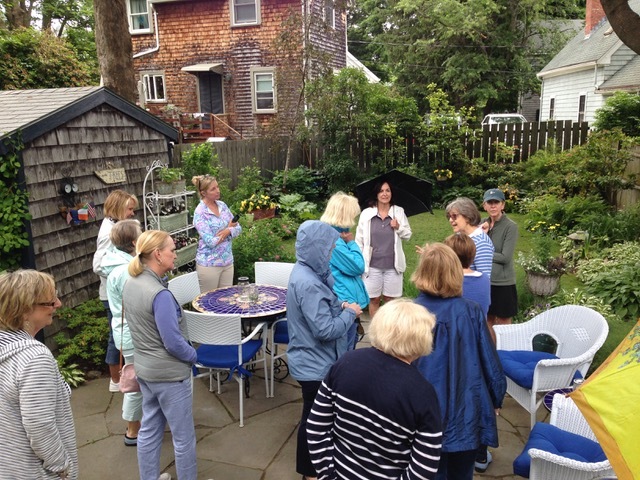 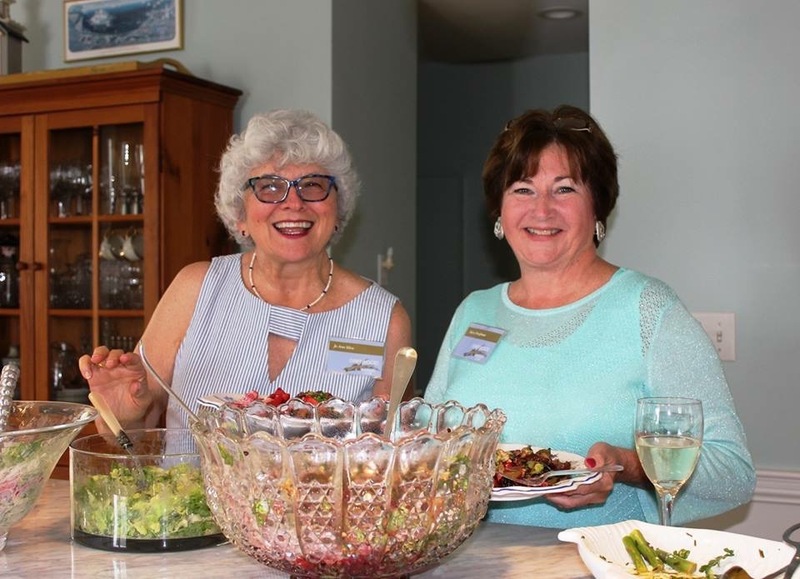 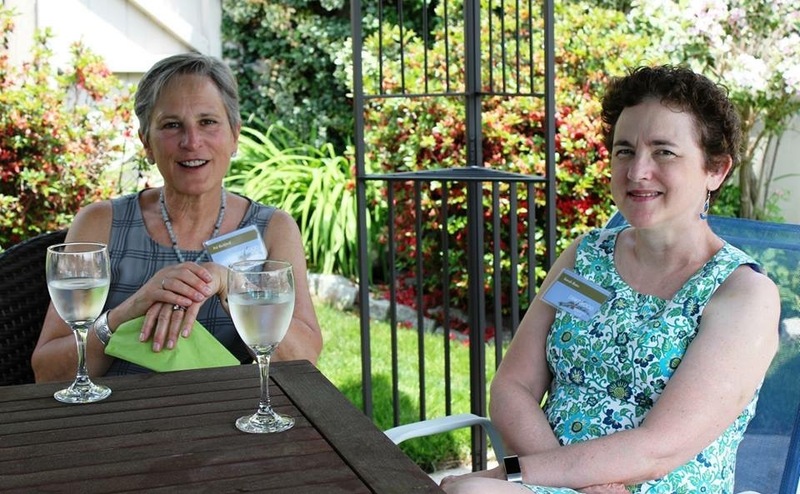 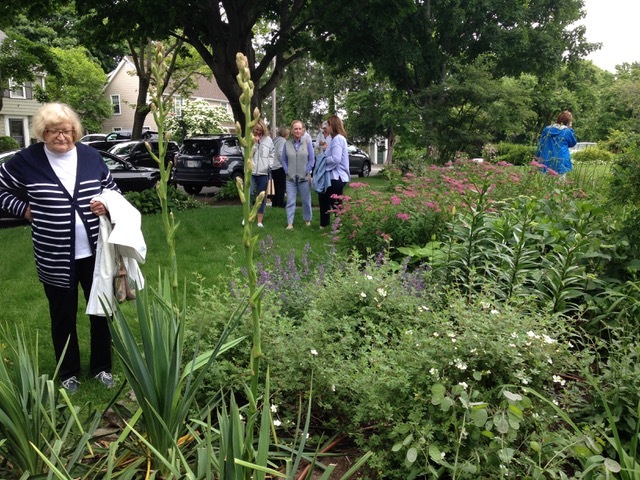 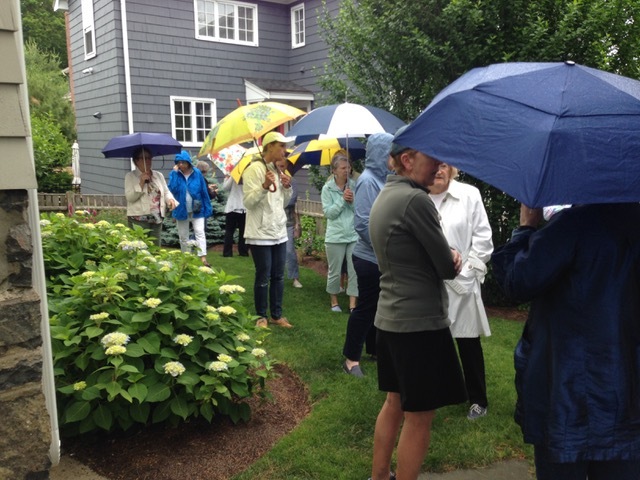 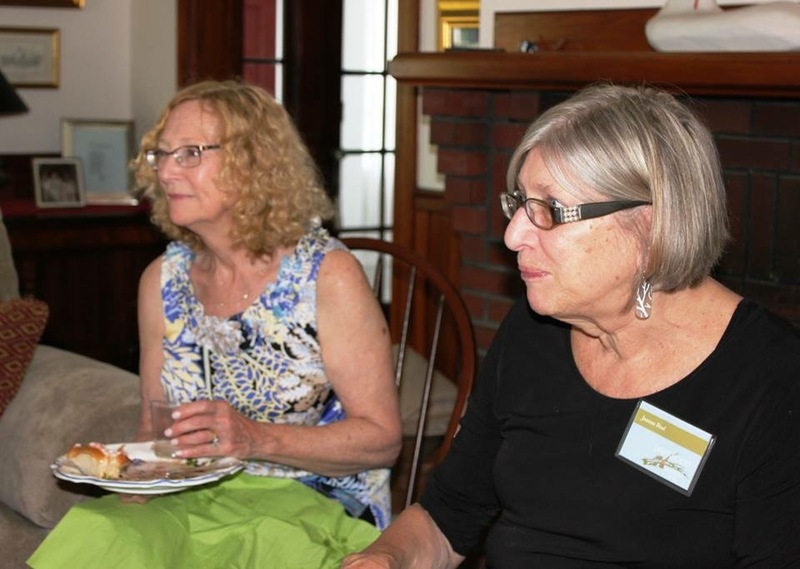 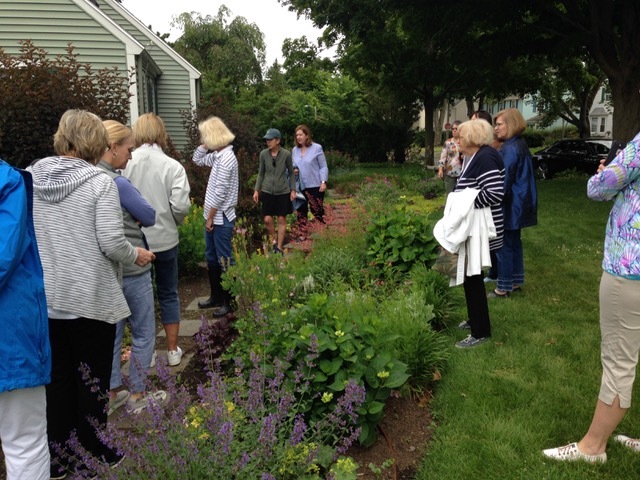 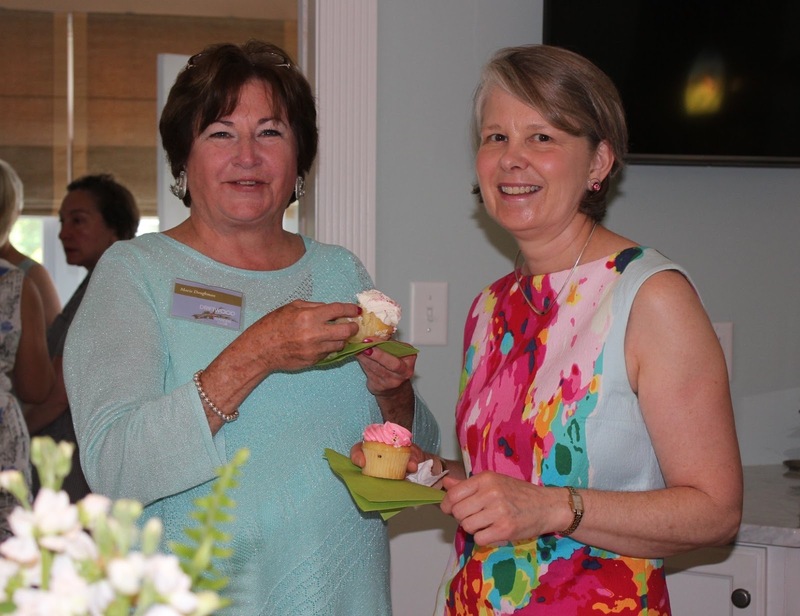 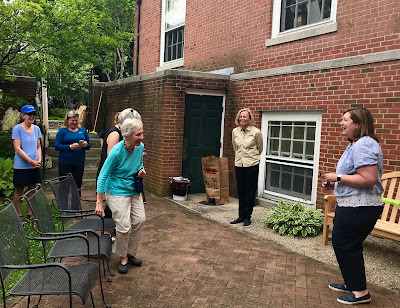 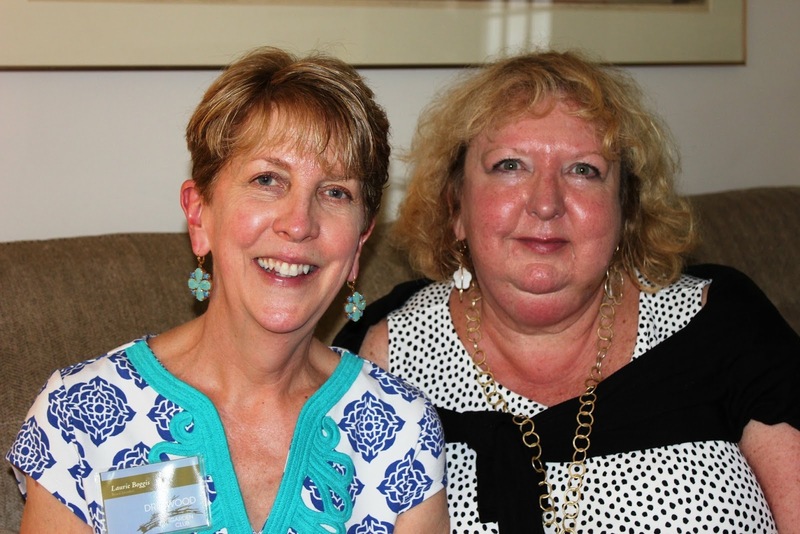 The Driftwood Garden Club officially finished the season with a June members' gardens tour and the dedication of a new bench to honor a beloved former garden club member. 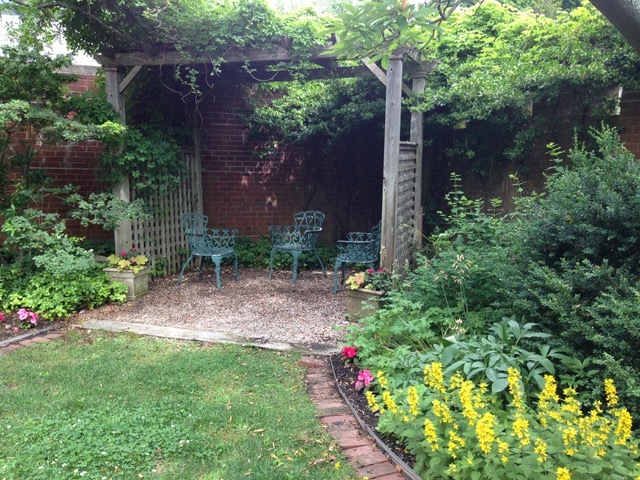 Nancy's garden: a charming cottage garden in the front and lovely shaded patio garden in the back, with a beautiful and florally decorated porch. 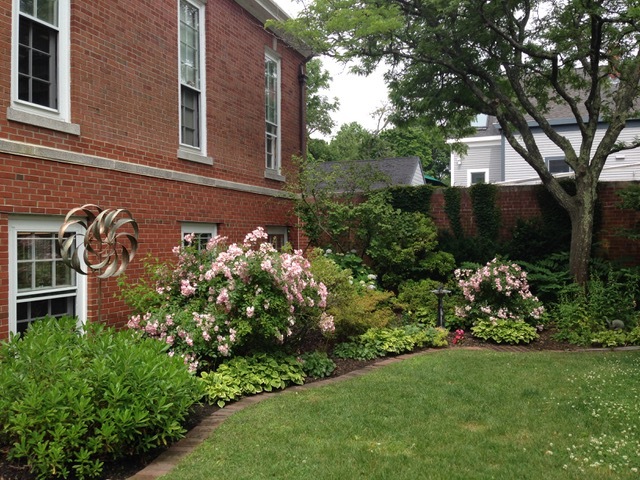 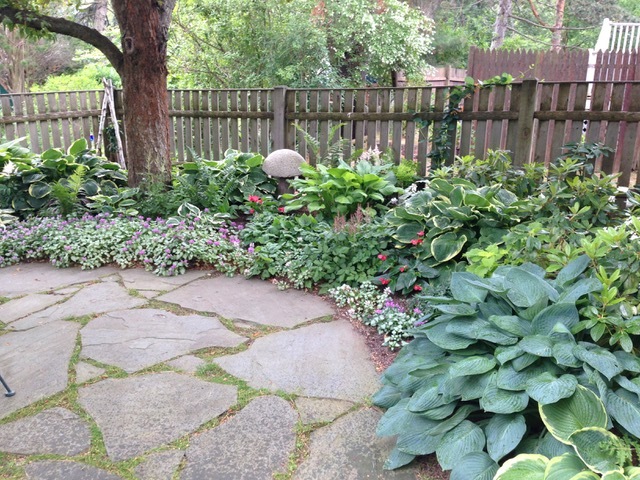 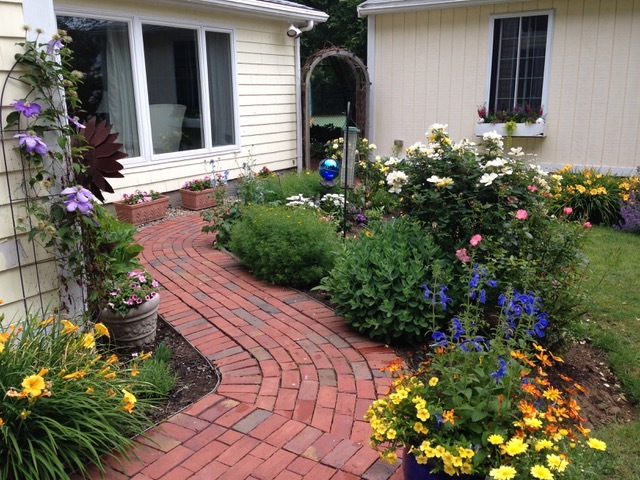 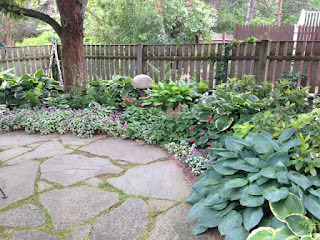 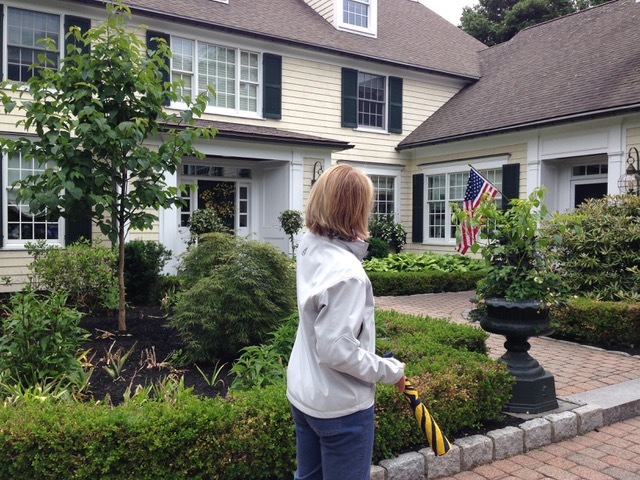 Laurie's garden: a small Beacon Hill style rear garden with lush plantings, including a blue hydrangea border and fieldstone patio with shade plantings under a cherry tree. We loved her buckwheat hull mulch! 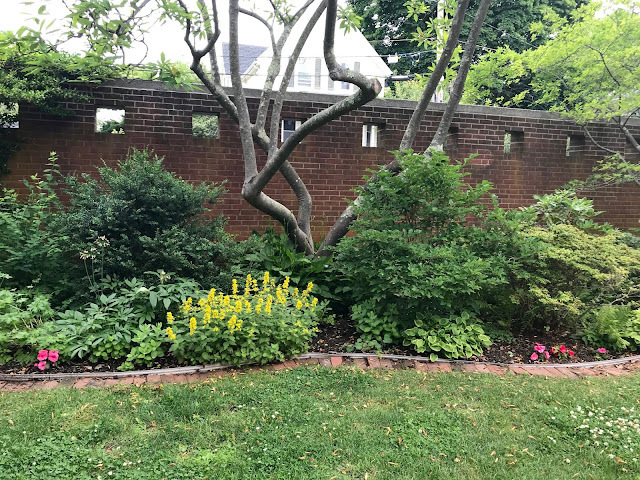 Pal’s garden: beautiful sunny borders packed with a wonderful variety of perennials where she has let wildflowers (like cowslip) stay and flourish. 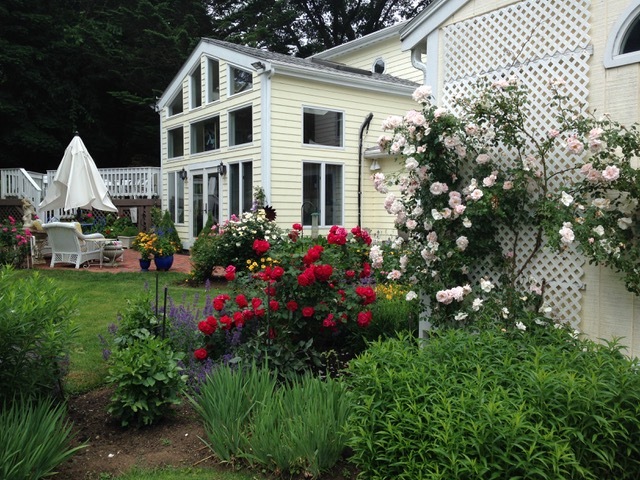 Ginny's garden: a sequence of garden rooms, each with a different theme in a mostly shaded property: Provence garden, Japanese garden, roses and perennial border, Buddha garden with wildflowers, woodland walk garden. 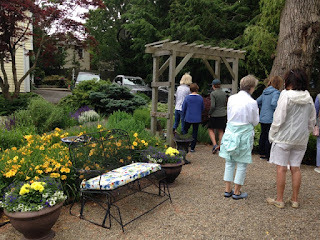 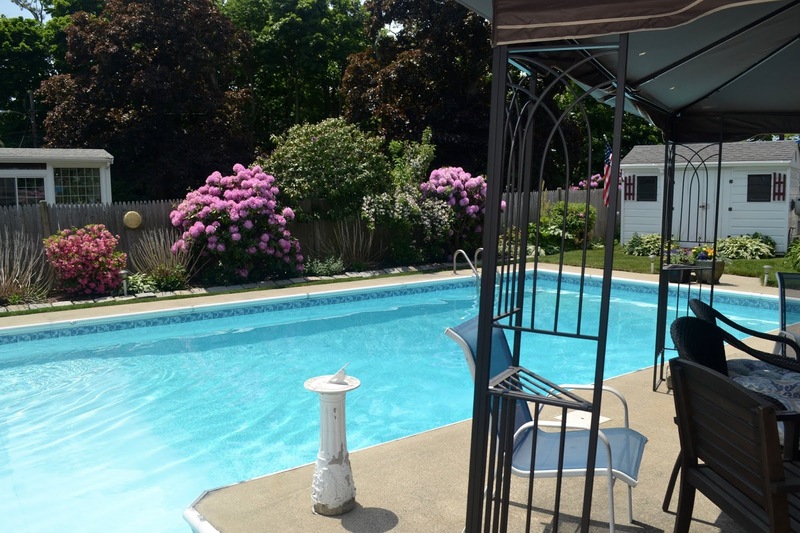 Andrea's garden: a magnificent estate garden with 1 1/3 acres of mass plantings including a rhododendron forest walk, lush border shrubs and flowering kousa dogwood trees, a clematis arbor walk, and a newly planted "handkerchief" or dove tree in the front garden. 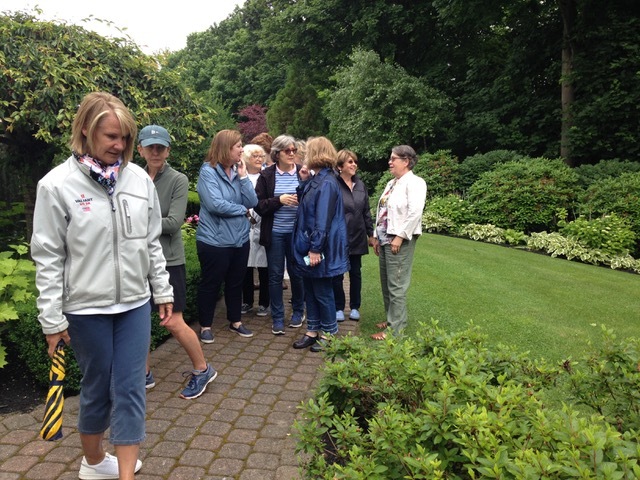 Many thanks to the members who donated their time and gardens for our enjoyment, and thanks to DGC members who brought their enthusiasm on a rainyish Saturday! 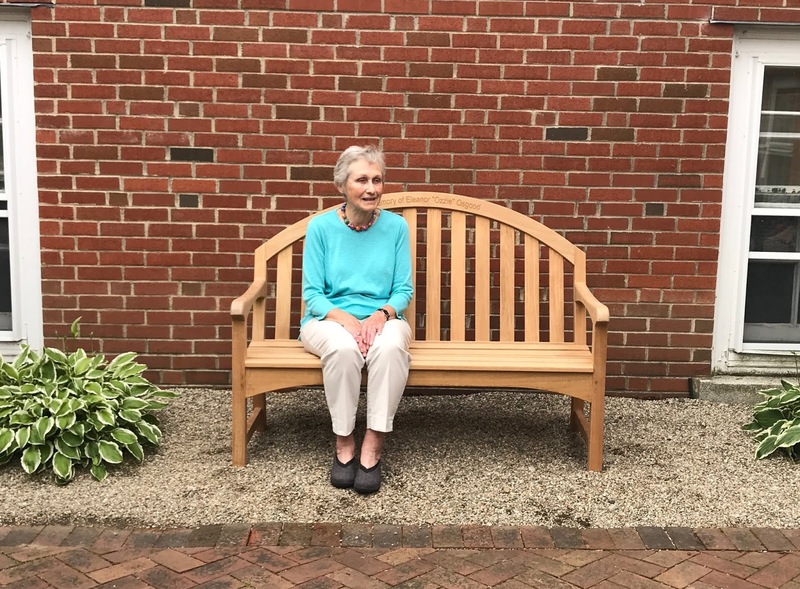 A few days later, members got together again to hold a small ceremony to commemorate the new bench donated by Allison Fowler, daughter of former member Ozzie Osgood. 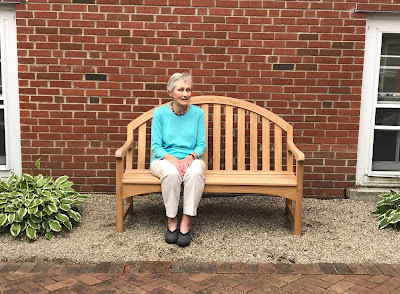 Ozzie originally donated a bench years ago, and this bench replaces the original. 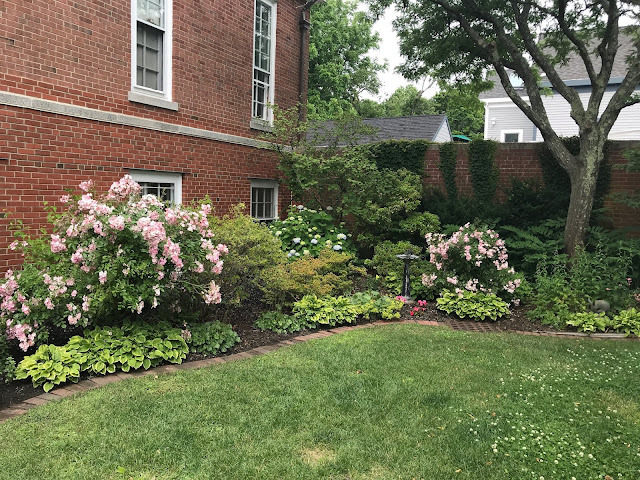 It sits in the library's Secret Garden, where it offers a place to relax, enjoy the garden, and remember the contributions of a former beloved member of the DGC. 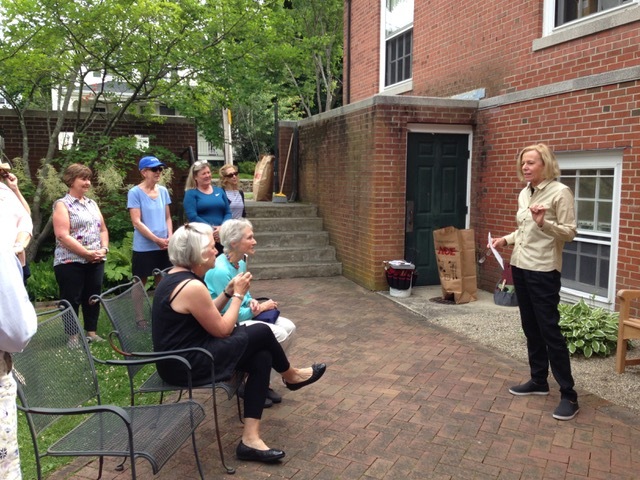 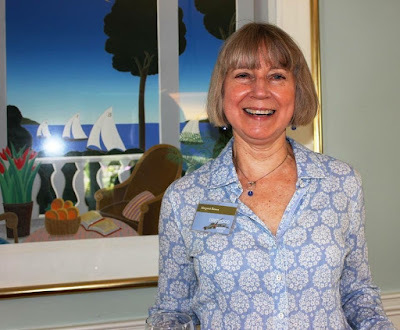 Evonne P. introduced the ribbon-cutting ceremony, and we also heard from former member Susie Hubbard Ryan and our own Sue B., both of whom fondly recalled their gardening days with Ozzie. Susie officiated at the original bench dedication, honoring Ozzie back in the summer of 1992! 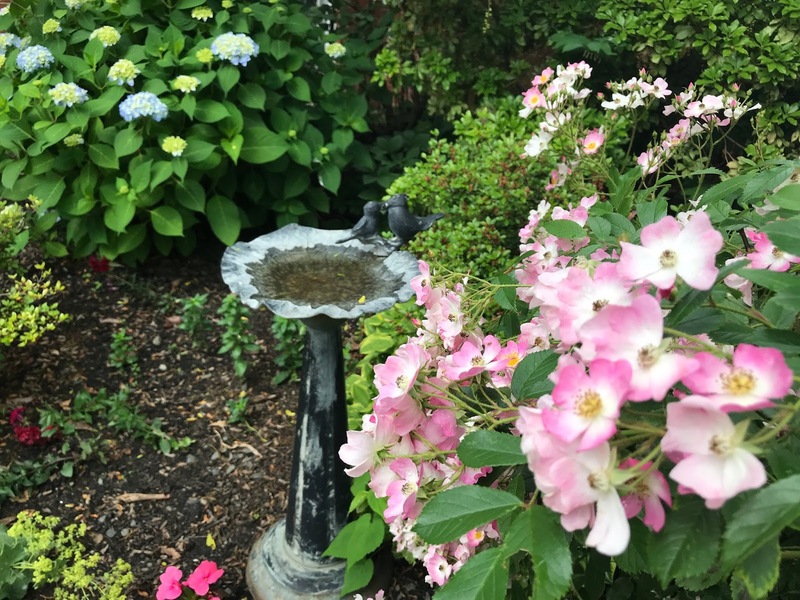 This very familiar bird bath was also donated by Ozzie many years ago! 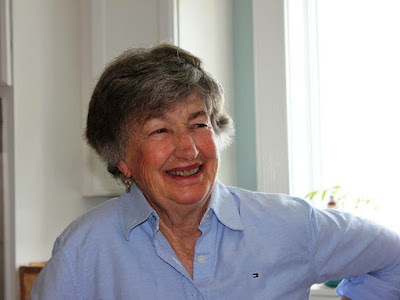 DGC historian Ginny vR. 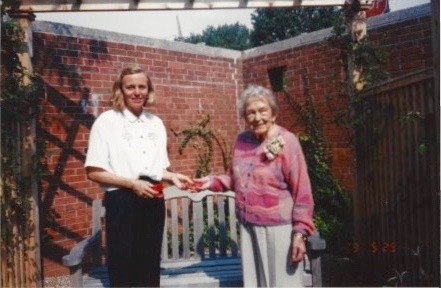 found this old photo of Susie and Ozzie at the original bench donation in 1992! 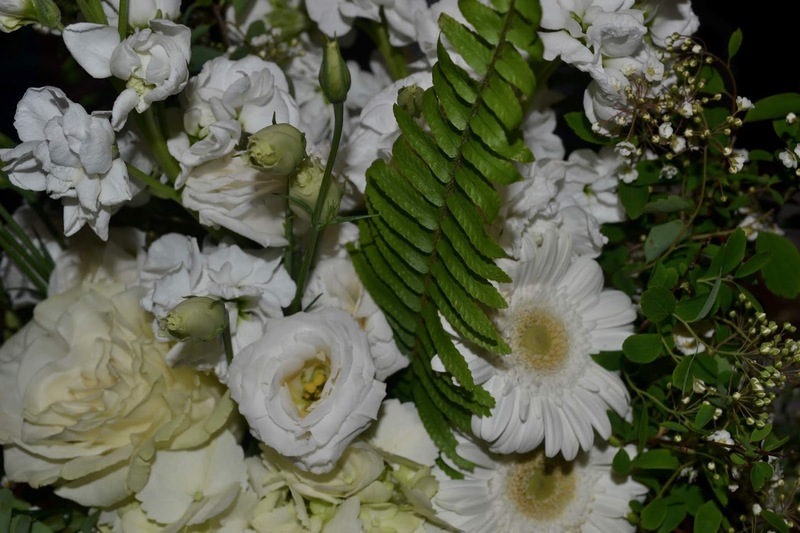 Many thanks again to all our board members, especially Evonne P., our president, Kathy B., vice president, and Susan M. and Ellen N., our program chairs, for another wonderful year of gardening, adventure, and friendship. Happy summer!
. . . and hopefully DGC members have found a little time to spend in their gardens! 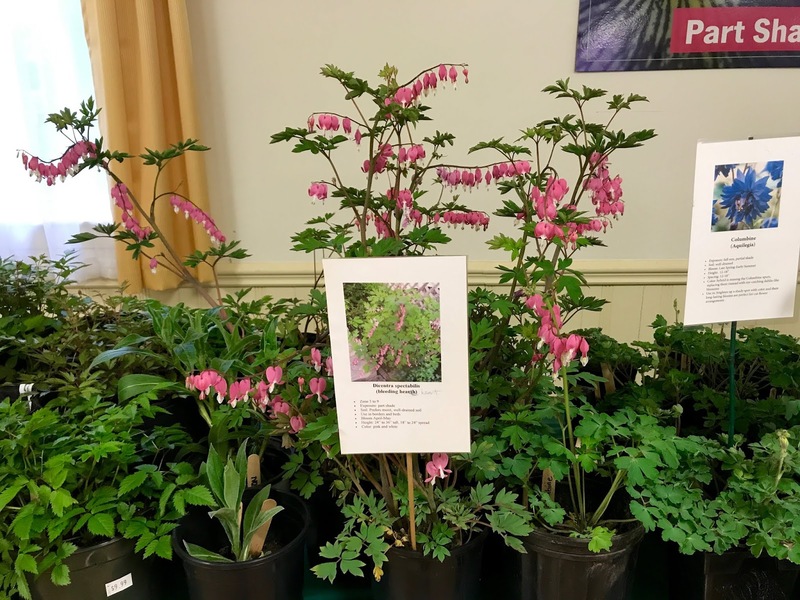 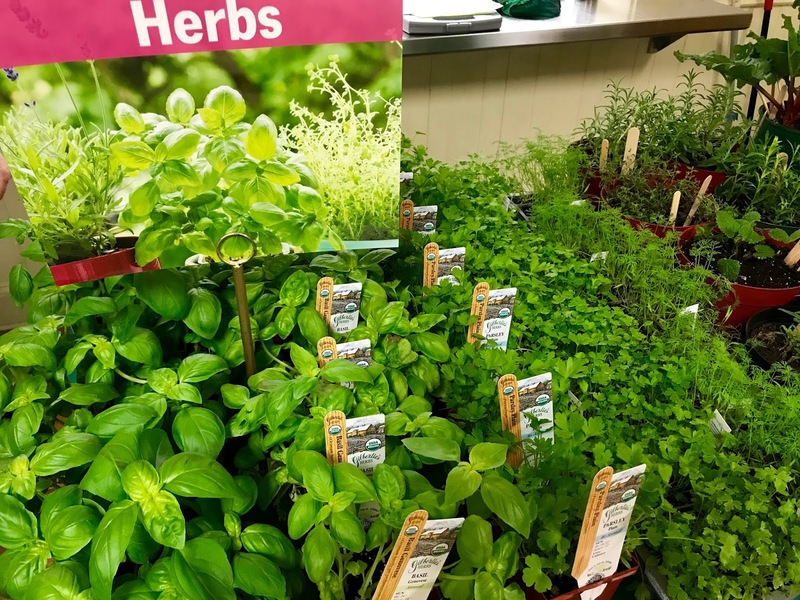 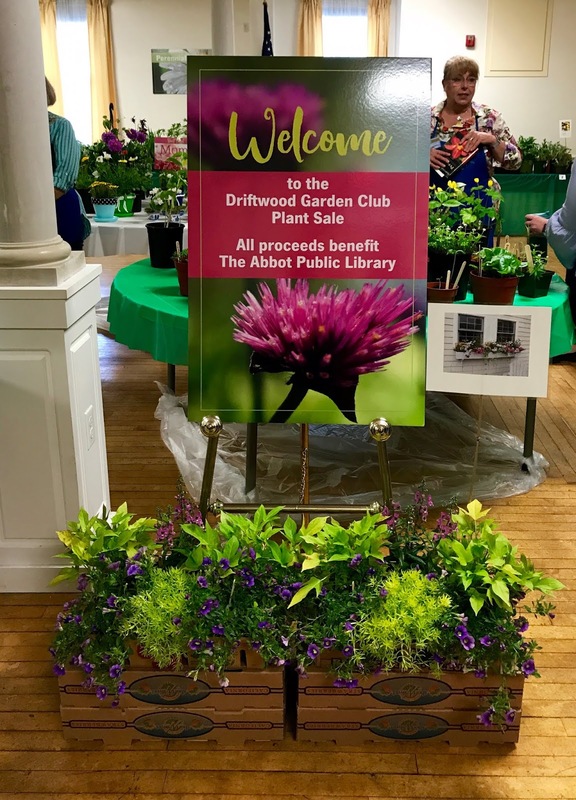 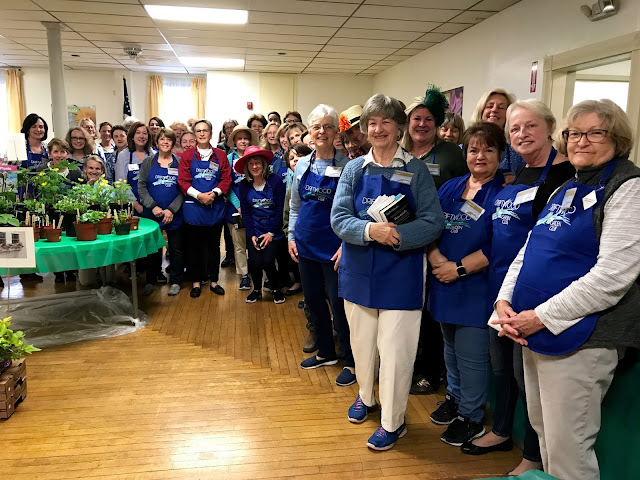 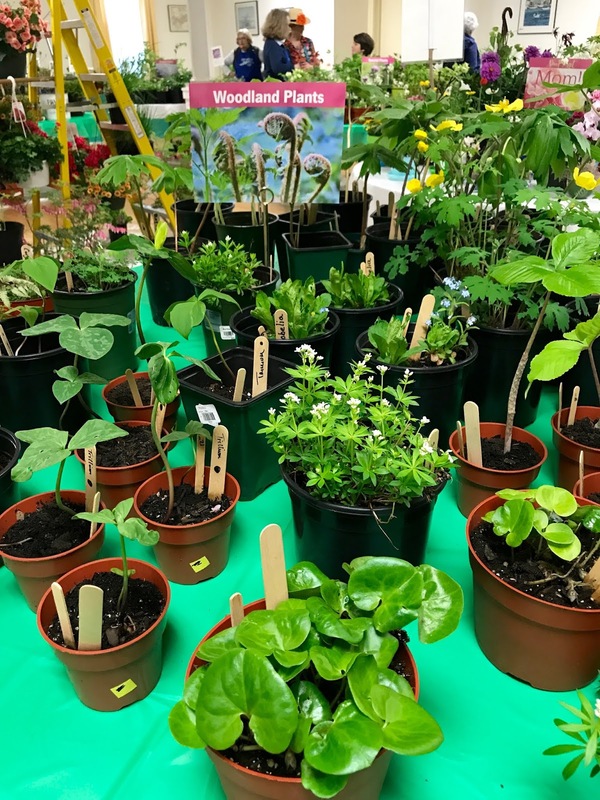 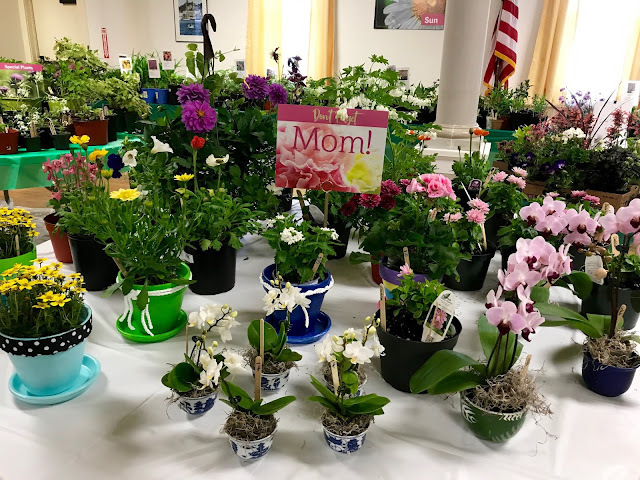 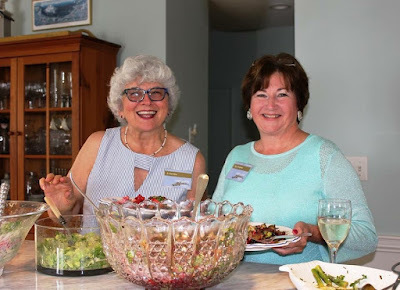 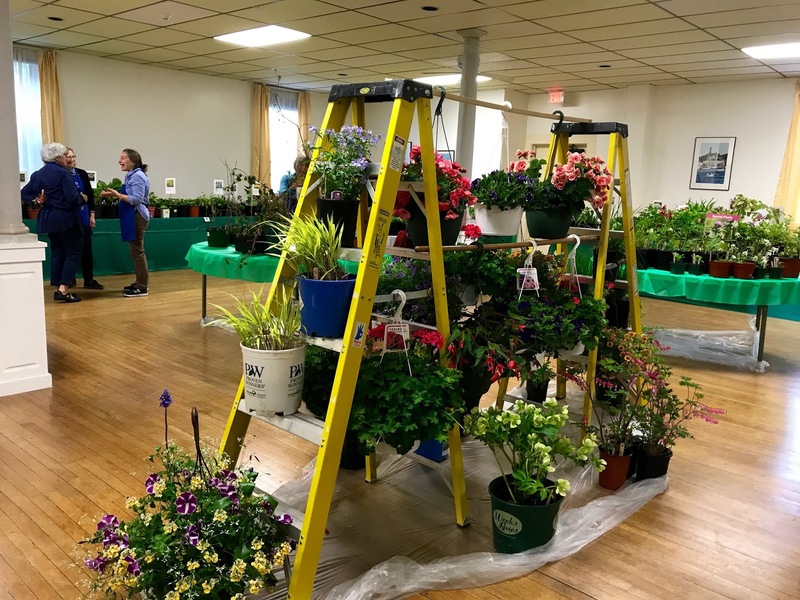 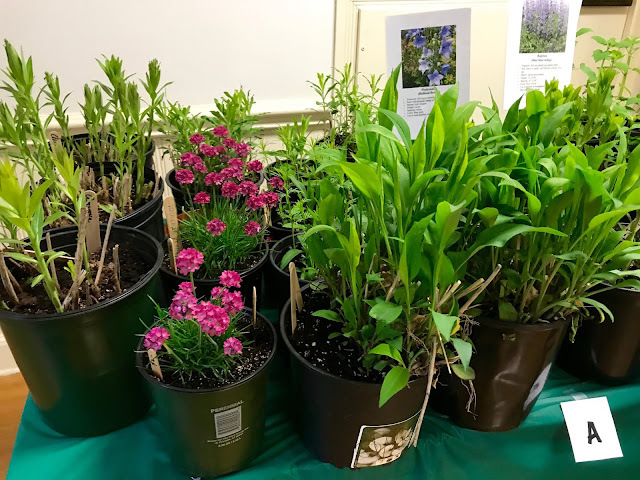 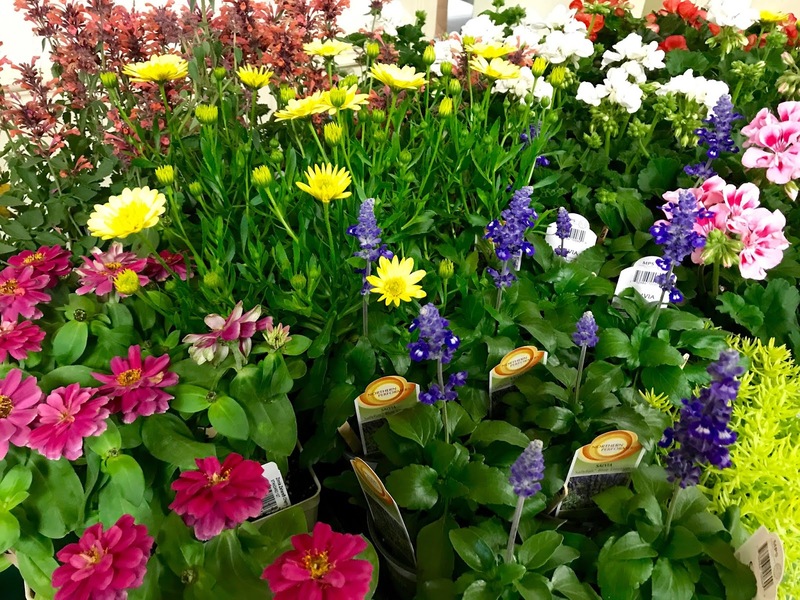 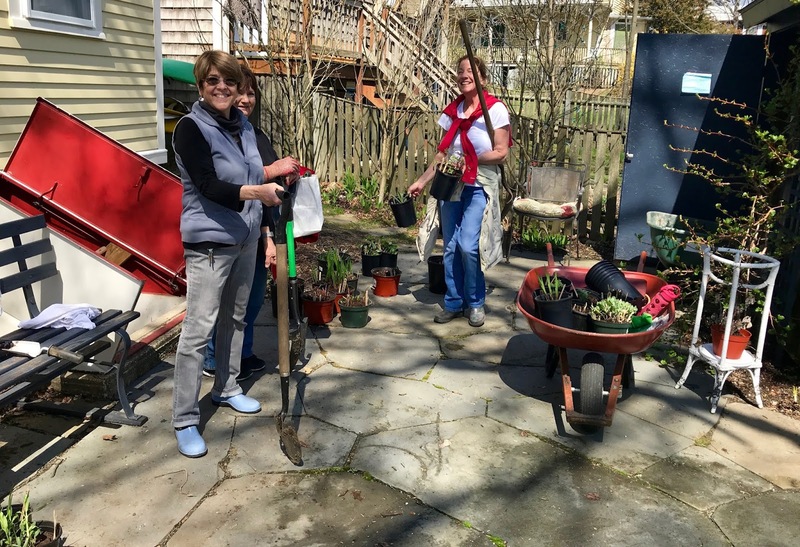 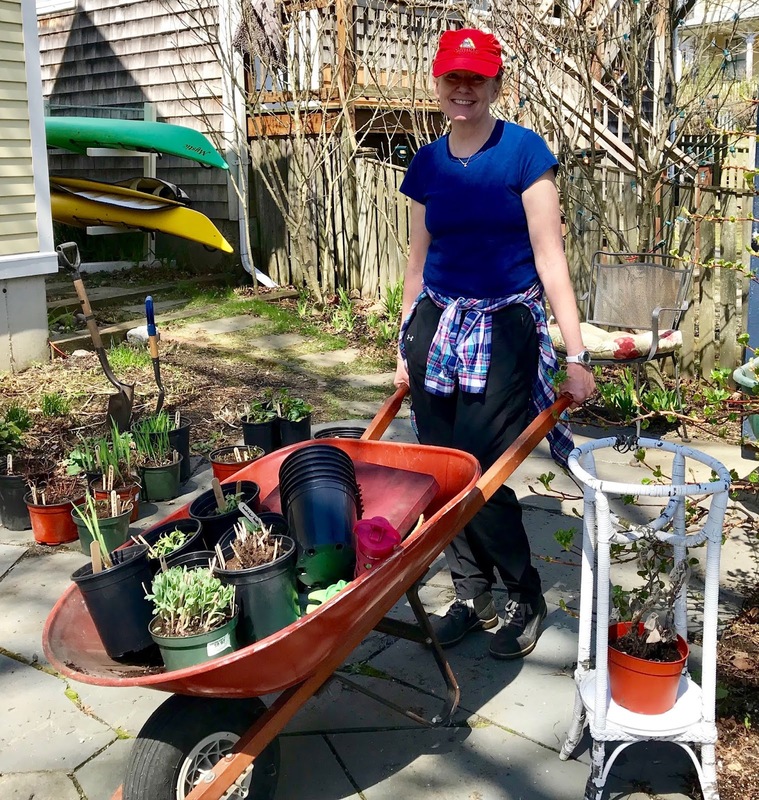 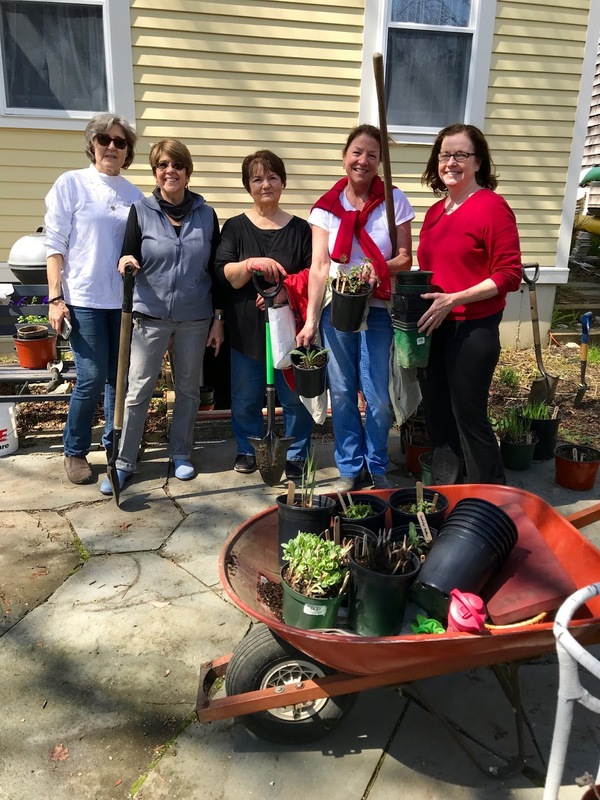 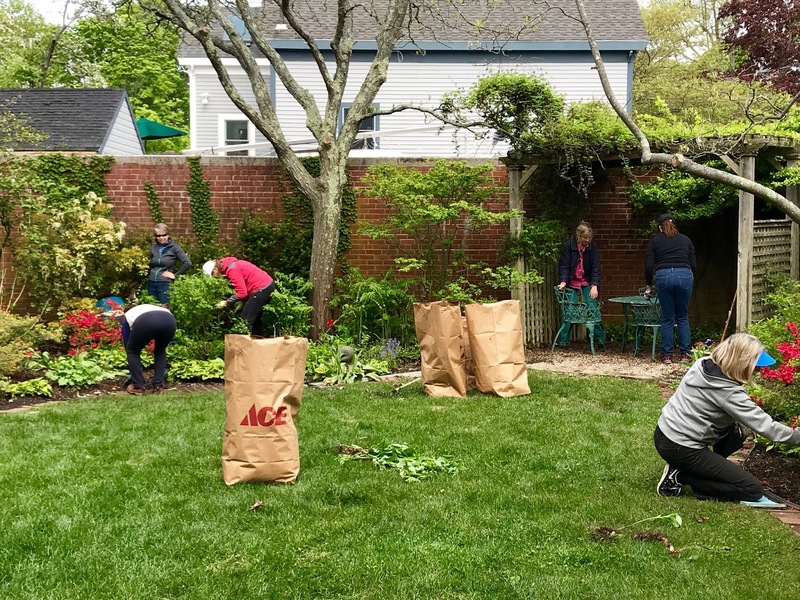 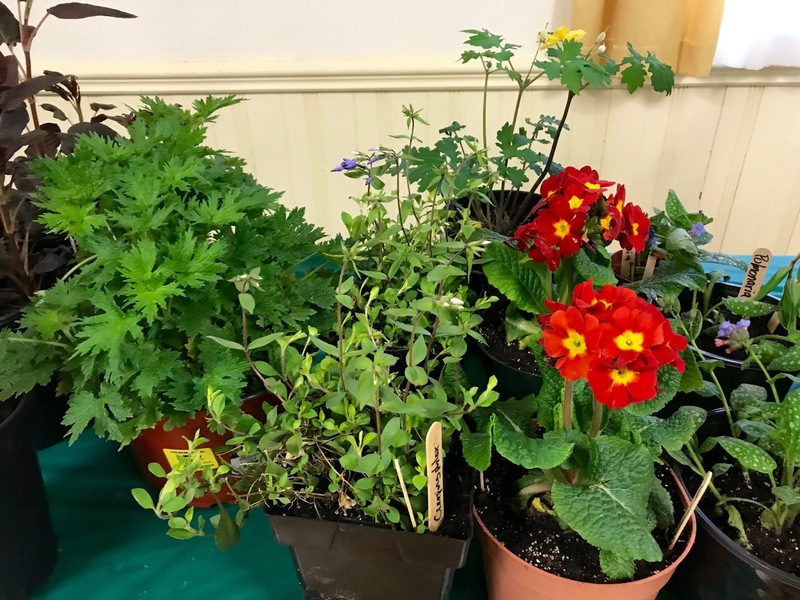 Members were busy as usual this spring with dig and divide, spring clean up at the library, our fabulous plant sale, and our end-of-year meeting and luncheon. 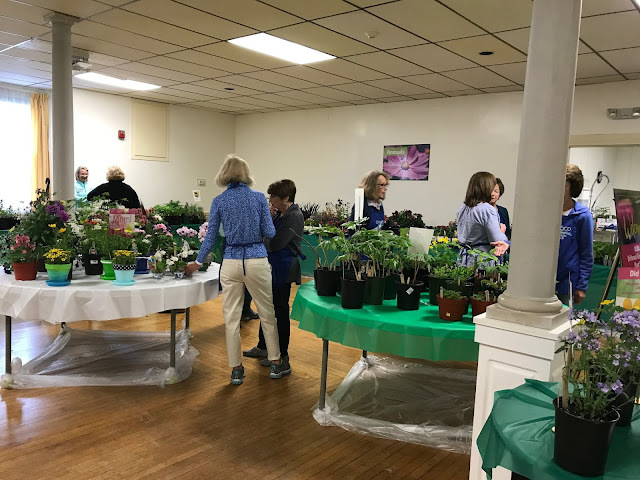 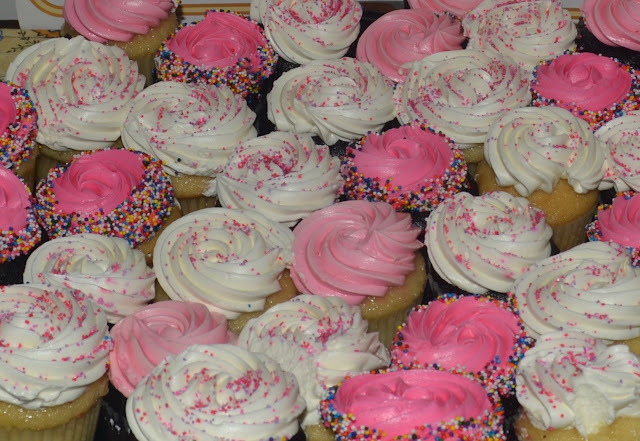 Ways and Means organized another successful dig and divide, and co-chairs Trish M. and Kathi V. and their entire team contributed many hours to put together another amazing sale. Lisa B. offered a choice of four days to get the grounds at the Abbot in tip-top shape during our spring clean up, and the library gardens are looking better than ever. 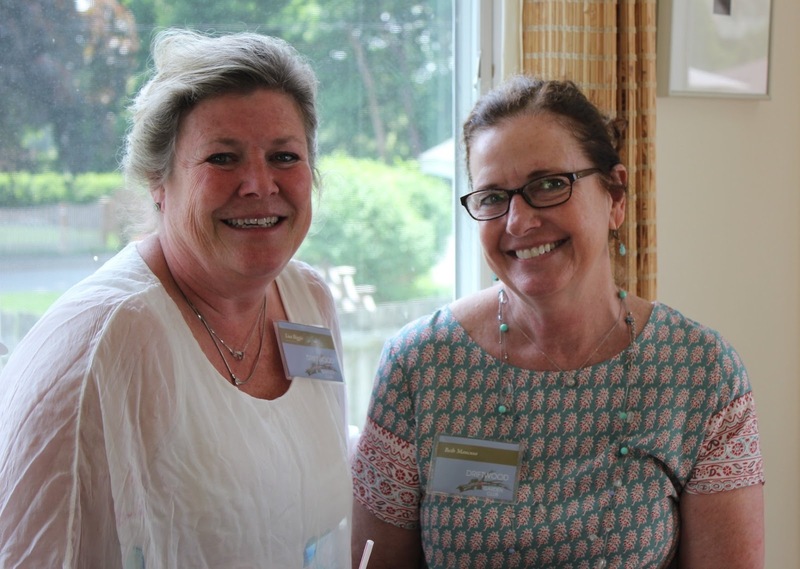 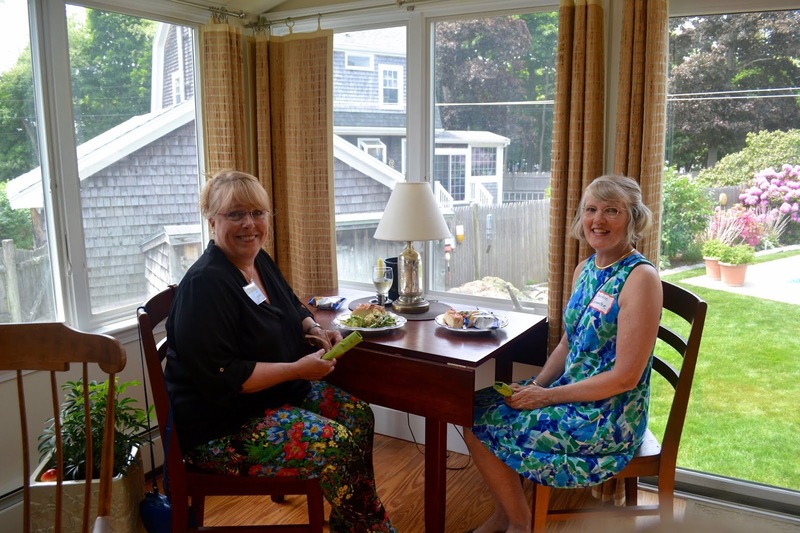 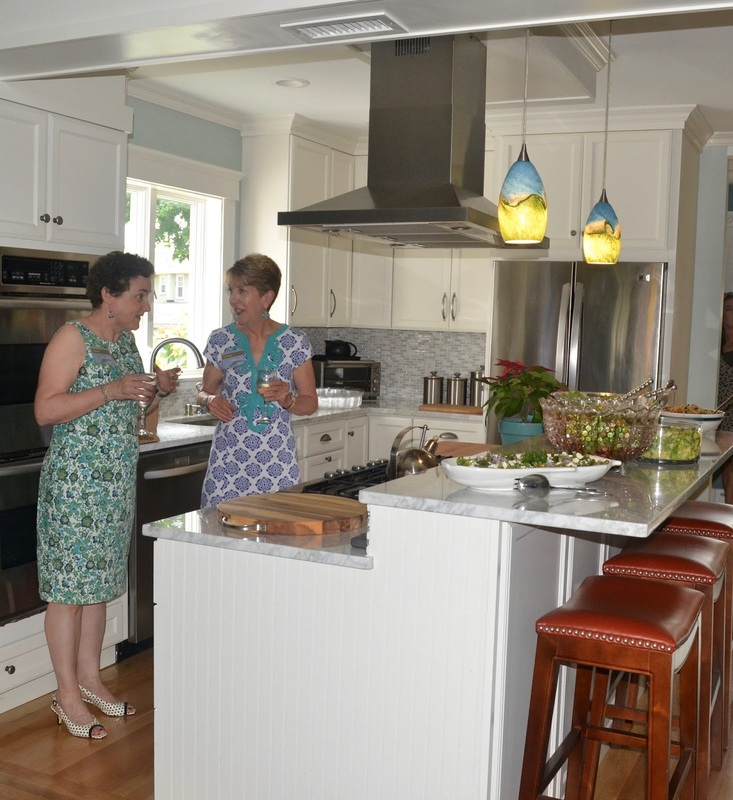 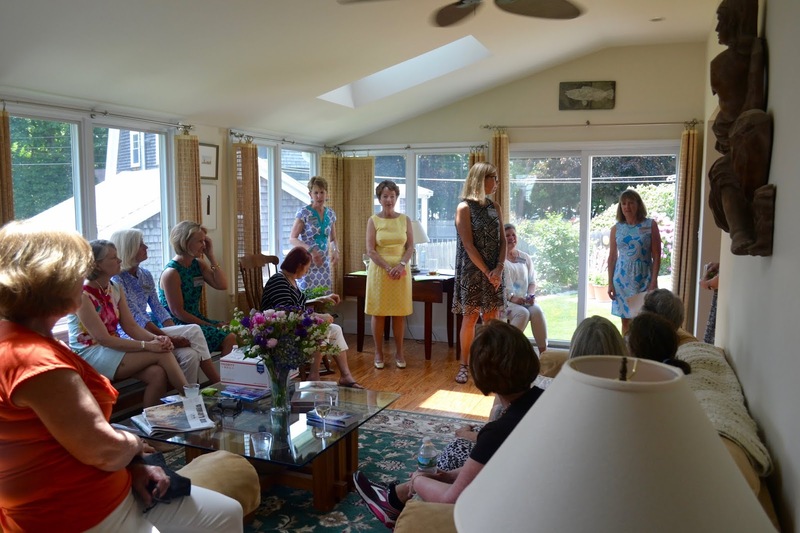 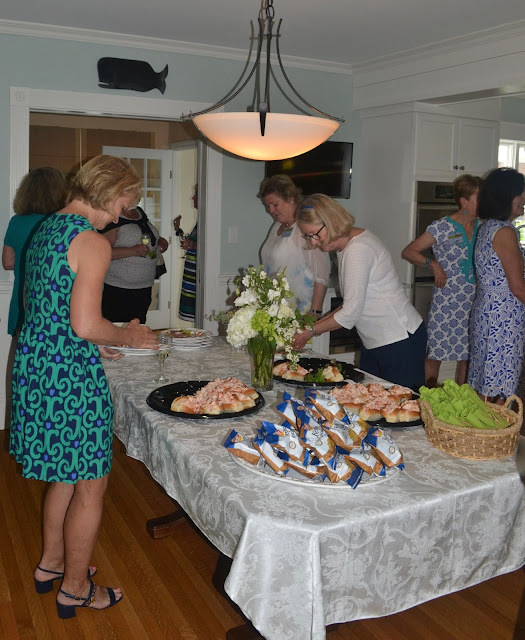 Finally, Joy P. welcomed members into her beautiful home for our annual meeting/luncheon, and we had a great turnout. 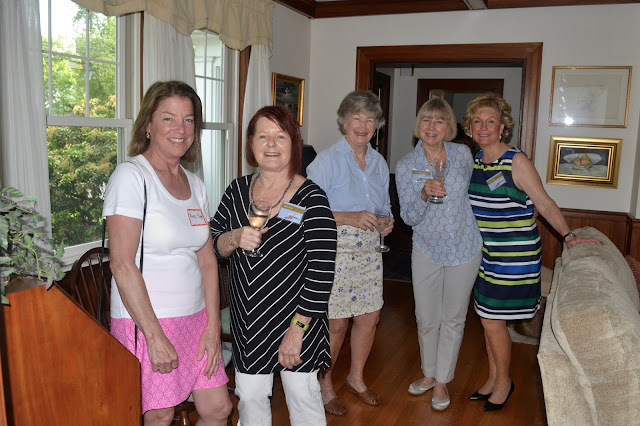 Many thanks to all of our 2017-18 board members who have worked so hard to help our club reach its goals while keeping things interesting and fun. 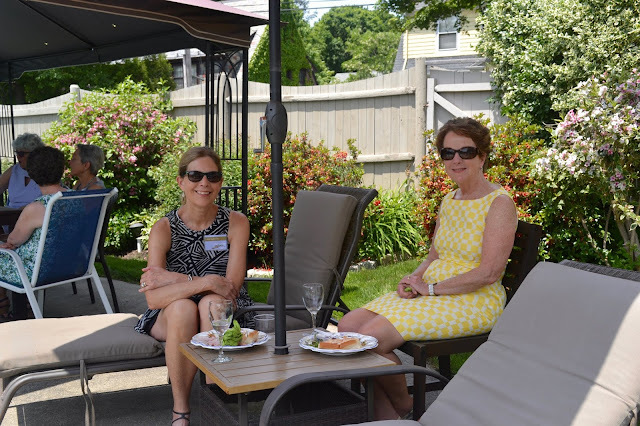 Best wishes to all for a happy summer, and stay tuned for Ginny vR. 's photos from the English garden tour!